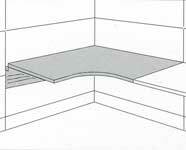 This 90 corner work surface hangs from frames, off-module lower tiles or wall strips. It has a left-or right hand extensions with an ellipse end, a laminate top and vinyl edge and a 1" gap at the back of the surface for standard plug head and cord passage. 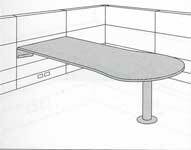 The work surface with column has a support column on the ellipse end that adjusts the height from 27-1/2" to 31-1/2". 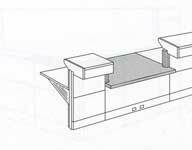 The work surface without column has a predrilled holes to attach a work surface understructure. Attachment hardware is included. Part # E2142 This 120 corner work surface hangs from frames. It is 24" deep and has a laminate top and vinyl edge and a 1" gap at the back of the surface for standard plug head and cord passage. Attachment hardware is included. 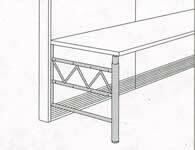 This peninsula hangs from a frame, off-module lower tile, or wall strips. It has a laminate top and vinyl edge and a support column that adjusts the height from 27-1/2" to 31-1/2". There is a 1" gap at the back of the surface for standard plug head and cord passage. Attachment hardware is included. Part # E2165 This peninsula hangs from a frame-off-module lower tile, or wall strips. It has a It has a laminate top and vinyl edge and a support column that adjusts the height from 27-1/2" to 31-1/2". There is a 1" gap at the back of the surface for standard plug head and cord passage. Attachment hardware is included. This perforated metal tile attaches to 1 side of a frame. It has 1/2" round perforation spaced 1/2" horizontally and 1/4" apart vertically . 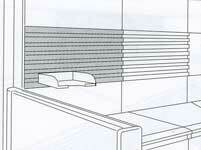 A translucent plastic insert can be specified for privacy. 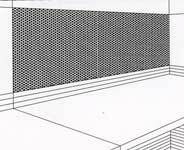 Part # E1442 This perforated metal tile attaches to 1 side of a frame or to wall strips and holds lightweight work tools. It has oval perforations spaced 1" horizontally and 3/4" apart vertically. The oval perforations are 3/4" wide x 1/2" high. 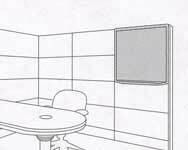 A translucent plastic insert can be specified for privacy. 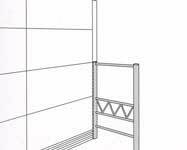 This rail tile attaches to 1 side of a frame or to wall strips. It holds work tools. Attachment hardware is included. Available Widths: 24",30",36",42",48" This tool bar attaches to a frame or wall strips in 1" increments. It holds paper tools. 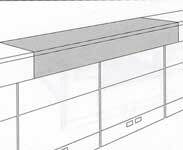 This metal rail hangs on a monorail, work surface-attached screen, monorail attached screen, or 54" high open return to hold work tools. Attachment Hardware included. Part # E3611 This tile attaches to 1 side of a frame of equal width and has an erasable writing surface. It has an inner tone light surface and a black umber frame and marker tray. This black, mesh pouch attaches with Velcro to most surfaces. It includes 4 erasable markers and an eraser. Part #G7230 This 16" high-tile attaches to 1 side for a frame of equal width. It has 4 vertically divided pockets for storage and display and includes 8 pocket divider clips. The top 3 pockets are 8" deep and the bottom 4" deep. 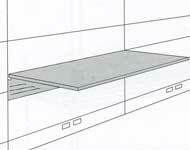 This work surface hangs from a frame a frame, off-module lower tile, or wall strips. 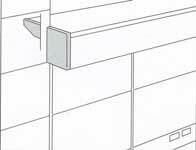 It has a laminate top and vinyl edge and predrilled holes for a pencil drawer and suspended pedestals. 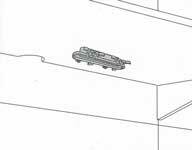 There is a 1 gap at the back of the surface for standard plug head and cord passage. Attachment hardware is included. 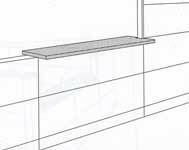 Part#E2110 This 9 corner work surface hangs from frames or wall strips. It has a laminate top and vinyl edge and a 1" gap at the back of the surface for standard plug head and cord passage. Attachment hardware is included. 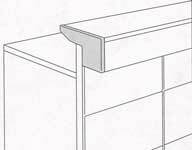 This wedge attaches to 2 work surfaces at a 90 angle to provide a corner work surface. It can be used with Action Office Prospects, Q and Ethospace system. The wedge has a laminate top or a vinyl edge or veneer top and edge. Attachment Hardware is included. 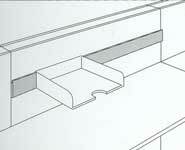 This 90° corner work surface hangs from frames, off-module lower tiles, or wall strips. 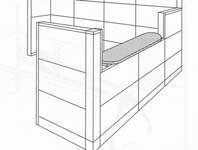 It has a cable management trough and has a laminate top and vinyl edge or a veneer top and edge. Attachment hardware is included. 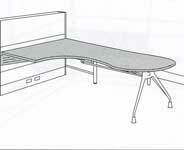 This 90 ° work surface hangs from frames or wall strips,> It has a laminate top and vinyl edge or a veneer top and edge. The surface has a cable a management trough that hangs 2" below the surface. Attachment hardware is included. Part # E2247 This peninsula hangs from a frame, off-module lower tile, or wall strips. 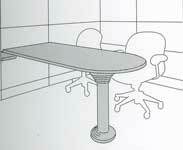 It has a support column that adjusts the height from 27-1/2" to 31-1/2" and a cable management trough. 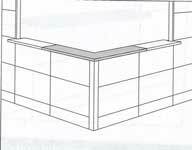 The peninsula has a laminate top and vinyl edge or a veneer top and edge. Attachment hardware is included. Part #E2358 This bracket supports a work surface on the left or right side. 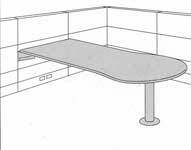 It can be used in conjunction with an open return, work surface support panel, or support pedestal. Attachment hardware is included. 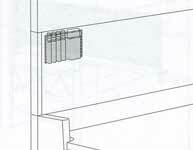 These supports attach a rectangular or corner work surface to a frame, off-module lower tile, or wall strip. Package contains 1 pair. Attachment hardware is included. 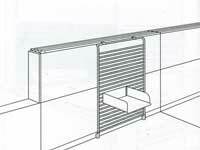 This panel attaches to both a work surface without a trough and a frame at the end of a frame mid run. It provides support and eliminates the need for a return frame, tiles, and a connector. 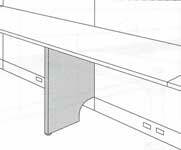 The panel has 2" glides that adjust the work surface height from a 27-1/2" to 29-1/2". A bracket is attaches right handed but can be field modified for left-handed attachment. The panel has a laminate surface. 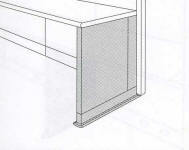 Part #E2284 This panel attaches to both a squared-edge bullnose work surface and a frame at the end of a frame run to provide support and eliminate the need for a return frame, tiles, and a connector. It has 2' glides that adjust the work surface height from 27-1/2" to 29-1/2". 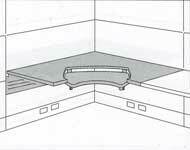 The panel attaches under a work surface at the left or right end of a frame. 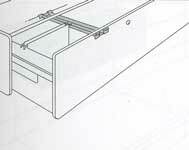 A bracket attaches on the right-hand side but can be filed modified to attach on the left-hand side. The panel has a laminate or veneer surface. 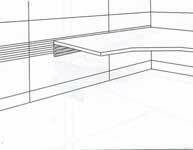 This panel attaches to both a squared-edge bullnose work surface and a frame at the end of a frame run to provide support and eliminate the need for a return frame, tiles, and a connector. It has 2' glides that adjust the work surface height from 27-1/2" to 29-1/2". bracket attaches on the right-hand side but can be filed modified to attach on the left-hand side. 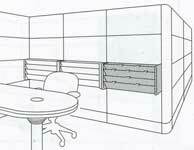 The panel has a laminate or veneer surface. Part #E2281 This metal open return attaches into a 2-3-or 4-way connector to provided support and eliminate the need for a return frame, tiles, and a finished end. It has 1-1/2" adjustable glides. Attachment hardware is included. 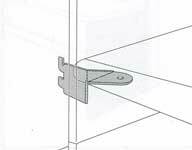 This metal open return attaches to a work surface and a frame or wall strip. It provides support and eliminates the need for a return frame, tiles, finished end, and connector. The open return has preset locations to adjust the work surface height from 27-1/2" to 31-1/2" and has a 1-1/2' adjustable glides Attachment hardware included. This oval surface attaches to the top of a frame to provided a counter or display surface. It is used only with a standard or veneer top cap. The surface is laminate or veneer; the base plate attached to the bottom of the transaction surface is black umber. Attachment hardware is included. Part # E2810 This 14"-deep rectangular surface attaches tot e top of a frame without a top cap. It provides a counter or display surface; ends are flush with the frame. The surface has a laminate top and vinyl edge. The surface is predrilled for a transaction surface task light. Attachment hardware is included. This 14" deep surface attaches to the top of 2 frames without top caps; the frames are connected by a 2-way 90° connector. 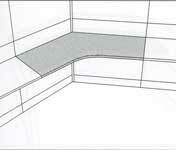 It provides a corner counter or display surface; ends are flush with the frame. The surface has a laminate top and vinyl edge and is predrilled for a transaction surface task light. Attachment hardware is included. Part # E2813 This work surface attaches to a transaction work surface frame and adjusts in 1" increments from 29" high to the top of the frame. It has a laminate top, vinyl inside and outside edges, and a cable management trough. 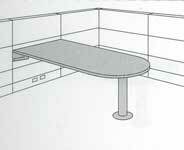 The work surface conforms to the Americans with Disabilities Act (ADA) guidelines. Attachment hardware is included. 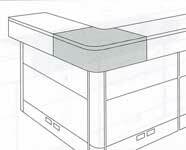 This surface attaches to the top of 1 or more counter top supports to provide a counter or transaction surface. It has a laminate top and vinyl edge. Attachment hardware is included. 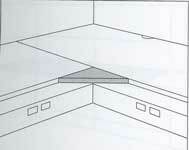 Part # E2830 This surface attaches to 2 counter top supports at a 90° or 135° corner. 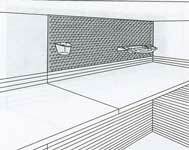 It provides a continuos counter top across the corner. 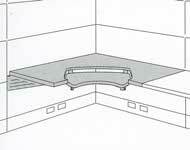 The surface cannot end a counter top; it must continue on both sides. The surface has a laminate top and vinyl edge. Attachment hardware is included. 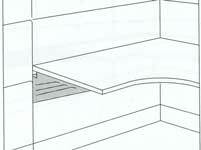 This laminate end cap with a urethane edge closes and finishes the end of a counter top. Attachment hardware is included. 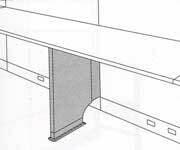 Part #E2833 This laminate end cap with a urethane edge closes and finishes the end of a counter top where 2 frames of unequal heights meet. Attachment hardware is included.